In a medium saucepan, melt the butter. Add the shallot and garlic and cook over moderate heat, stirring occasionally, until softened, about 2 minutes. Add the flour and cook, stirring, until the flour is golden, about 3 minutes. Whisk in the cream until smooth, then add the spinach. Cook, stirring occasionally, until the mixture is very thick, about 5 minutes. Stir in the cheese, nutmeg and lemon juice and season with salt and pepper. Let cool slightly. Preheat the oven to 450°. Set a rack over a large rimmed baking sheet. Arrange the filet on the rack and season the top with salt and pepper. Spread the creamed spinach evenly over the filet, leaving a 1-inch border around the edges. 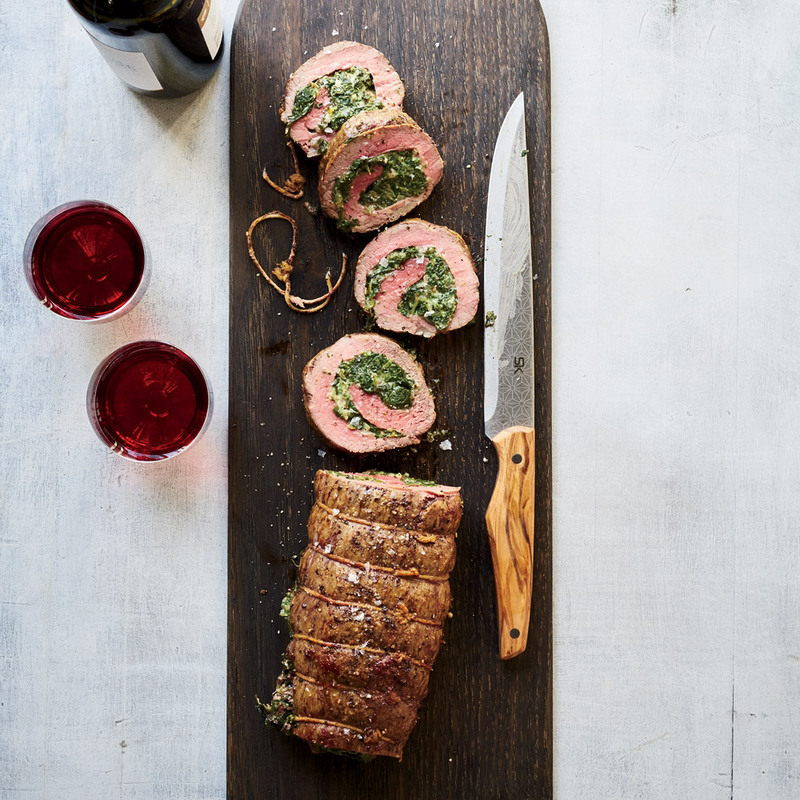 Roll up the filet and tie with kitchen twine at 1-inch intervals. Rub the filet with the olive oil and season with salt and pepper. Roast for 30 to 35 minutes, until medium-rare within and an instant-read thermometer inserted in the center registers 120°. Transfer to a cutting board and let rest for 10 minutes. Slice 1/2 inch thick and serve warm. The creamed spinach can be refrigerated for 2 days; bring to room temperature before using. Review Body: Creamed spinach stuffed filet is one serious dish!